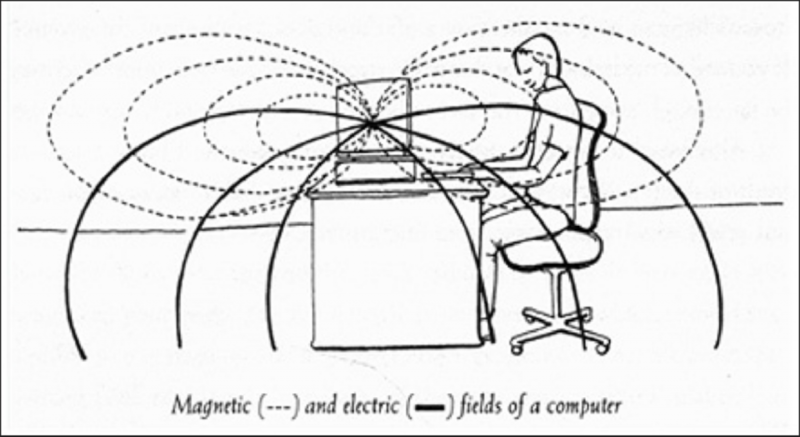 All computers emit radiation or electromagnetic fields (EMFs) on many different frequencies. These EMFs can be extremely harmful to your health. Cancer and other serious diseases have been linked to these exposures – studies indicate pregnant women and small children are particularly vulnerable. In this article I explain what you can do to minimize your exposure to these harmful EMFs. Whether you are already feeling symptoms around your computer and similar devices or are just eager to take measures to protect you and your family here are my (started off as 9 tips but has now grown) computer radiation protection tips. If your computer equipment is ungrounded, which is often the case with laptops, placing your hands on the keyboard can engender high electric field exposures. This alone can cause a myriad of symptoms such as extreme fatigue, agitation and numbness, tingling, weakness, and other problems in your hand or wrist – not unlike carpal tunnel syndrome. The good news is that electric fields can be dealt with fairly easily by grounding your computer equipment – you can expect an immediate reduction in fatigue and a gradual reduction in these other symptoms simply by grounding (see my comments below on how to ground). If you are using a computer which is not grounded (as in the video above) then my tests show the best way to cut down on your exposure to electric fields from your laptop is to use it on the battery instead of the mains power supply. 2. Magnetic fields. All computers as soon as they’re switched on also generate magnetic radiation or magnetic fields. These exposures can be significant particularly if you’re using a laptop or computer tablet in close proximity to your body. Studies show elevated health risks with magnetic field exposures as low as 2 milliGauss (mG). This video shows some typical magnetic field exposures from a laptop computer (many laptops and tablets emit significantly more than 2 mG). The most common sources of this magnetic field are the motor of the hard drive inside your computer and also from the in-line transformer unit (all computers have some form of transformer to convert from the mains supply, 110 or 240 volts depending where you live, to the lower voltages computers use). If you have a laptop, consider using an external keyboard and make sure the transformer unit (often a little rectangular box in the cable) is situated at least a few feet from your body. If you have a desktop keep the CPU at least 3 feet away from your body. 3. Radio frequency radiation. The third issue is radio frequency or RF radiation. We live in an increasingly wireless world. Most computers, be they desktops, laptops or tablets now have WiFi functionality. 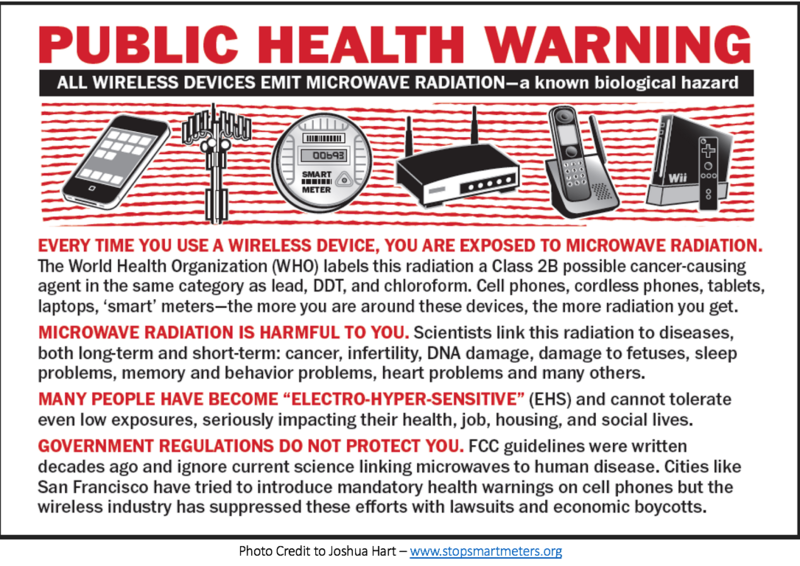 This means you’re being exposed to another layer of electrosmog, RF radiation, from two sources. Firstly from the computer itself; most computers, especially laptops, are configured by default to be in WiFi mode. So even if you are on a hard wired Ethernet connection your laptop is still emitting and receiving RF radiation. You need to go into the settings and disable the wireless (possibly WiFi and Bluetooth) functionality. Be careful because many modem/routers are now factory configured to automatically re-enable WiFi when they receive an update – this can be several times a day. So even if you disable the WiFi in the settings menu it may be subsequently re-activated without you knowing. There are several solutions. The easiest is usually to replace your wireless installation with a hard-wired Ethernet connection and make sure the WiFi function is disabled. If your Internet is supplied by cable you need to buy a (wired) cable modem router which sends the Internet signal over existing coaxial cables in your house – some homes are already equipped with coaxial cables for the TV. Then you would use a Coax-Ethernet Adapter Kit to be able to connect your computer via an Ethernet cable to the coaxial wall socket. Increasingly, powerline networking (sometimes called powerline ethernet or broadband over power lines) whereby special adapters are used to send the Internet signal through your electrical wiring is being touted as a safe alternative to WiFi. This can give rise to dirty electricity issues. A number of people have reported experiencing symptoms with these installations. I do not regard them as safe – I will speak more about this another day. 4. Laptops are not for laps. The best way to minimize laptop radiation is not to use your laptop computer on your lap. Studies show that over time using your laptop on your lap can significantly decrease your sperm count. Use your laptop on a desk or other surface away from your body. There are some good laptop radiation shields on the market but some laptop shields only shield RF radiation (which is not a problem anyway if you disable the WiFi) and some offer no protection from magnetic fields. 5. Computer monitor radiation. On a desktop computer the biggest problem is often the monitor, not the CPU. Primarily because the CPU sits further away. Reduce your exposure by sitting further away from your computer screen. This will reduce your radiation exposure, especially if you sit at least three feet from the screen (not too far to avoid eye strain) – EMF exposures decrease significantly with distance. If you’re using a desktop computer you can use a computer radiation filter over the screen or better still purchase a degaussed screen. For hands on practical solutions to EMFs click here. 6. Introduce houseplants. Those of you who enjoy houseplants will be happy to learn that some cactus plants have the ability to absorb the electromagnetic radiation coming from the computer. It was actually NASA who discovered this and ever since Cactii have become my best friend; I have lots of cacti in my office. Put some cacti around your computer. I use Cereus cacti. 7. Use a Himalayan salt crystal lamp. I’ve had one in my office for a long time. Electrical devices in our homes and workplaces release electromagnetic radiation in the form of positive ions. Himalayan salt crystal lamps release negative ions into the air, thereby creating an effect similar to an ionizer. These negative ions are thought to help cancel out the electromagnetic radiation being emitted by your computer and other electrical devices by helping to maintain a normal ionic balance in the air. 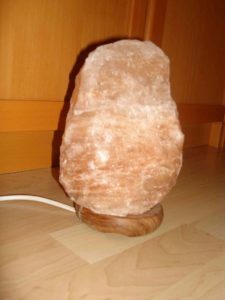 What the exact effect is regarding EMFs is difficult to know because there are no studies on the effects of Himalayan salt lamps. But research shows that salt has many beneficial properties including immune system support, removal of pathogens as well as antibacterial and anti-inflammatory properties. 8. Take regular breaks. If you use a computer for several hours a day then you’re probably all too familiar with the phenomenon of eye strain. The light emitted by computer monitors though it may appear steady actually has flicker. The rate of this flicker is linked to the refresh rate. Numerous studies point to the adverse effects of this flicker. Another issue is the blue light emitted by computer monitors. Harvard Medical School research indicates blue light at night has a harmful effect on your health. Blue light at night has been found to jeopardise hormone production circadian rhythm and can cause photoreceptor damage in your eyes. Take regular breaks, get out of your chair away from your computer every 20 minutes or so. Avoid using your computer at night and avoid other blue light exposures before you go to bed. 9. Antioxidant food. Much has been said about the value of antioxidant foods in keeping us healthy generally but these foods can also help to deal with free radicals caused by computer radiation. Tomatoes, cherries, apples, broccoli, and carrots all contain significant amounts of vitamins A and C. These foods supply your body with the raw materials it needs to create its own natural form of EMF protection. 10. Wash your face. Your face is usually the closest part of your body to the screen, and the particles of radiation can attach themselves there. It might come as a surprise to you to learn that simply washing your face after using the computer can remove the radiation that has settled there. 11. Go fully wired. Use a wired mouse, wired keyboard and wired peripherals. Even if you are using a laptop, using a wired external keyboard and wired mouse will significantly reduce your exposure to the EMFs emitted by the electrical components situated under the keyboard of the laptop. 12. Other people’s computers. It’s not just your computer you need to be wary of it’s other people’s as well. If you work in an office where there are several computers make sure you are not in close proximity (6 feet) to the back of someone else’s PC screen, and make sure you are not sat in close proximity to the office modem/router or any other electrical device which may be a major source of EMF exposures. 13. Watch out for the electric cables. A common mistake is sitting with your legs or feet in close proximity to the power strip into which you plug your computer, monitor, printer, modem and other office equipment. Whether you use a power strip or surge protection bar or not these cables are a source of high electromagnetic fields and should be avoided. Move these power cords as far away from your feet and legs as possible – even gaining a few feet can make a significant difference. Is Laptop Radiation The Biggest Threat? In my tests I’ve not found that laptops necessarily emit higher levels of radiation than desktops. EMF emissions vary from brand to brand and can even vary between different models of the same brand. The only way to know for sure your exposure levels is to measure with an EMF meter. To get a complete picture you need to measure the RF radiation levels, magnetic fields and electric fields, which usually means buying several meters. Start by buying a basic EMF meter. The biggest single problem with laptops is improper use. A lot of people use them on their laps and on their knees which is very dangerous. Laptops are tested 20 cm, that’s about 8 inches, away from the body. Keep your laptop at least 20 cm away from your body, if not further. 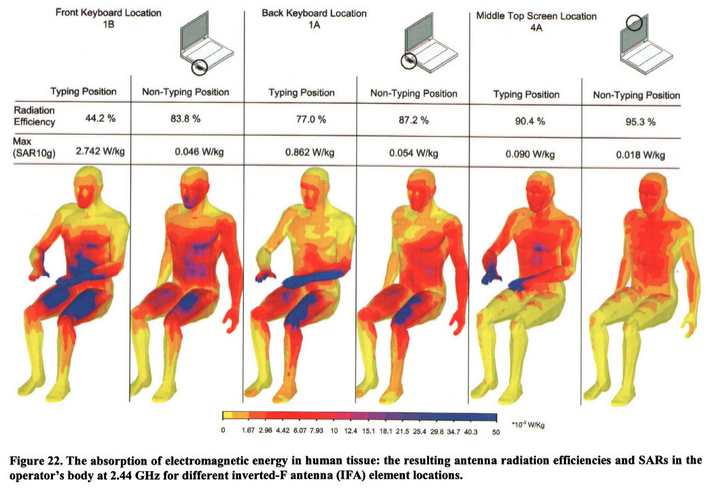 Radiation levels vary from computer to computer. Interestingly I have found the Macbook Pro to emit RF radiation from the mouse even with WiFi disabled. The radiation absorption (SAR) is related to the position of the WiFi antenna as the image below – source. They emit heat (EMFs) from the mechanical equipment inside them plus the radio frequency radiation from the WIFI antennas. Laptops and tablets are tested at 20 cm from the body (FCC,Bulletin 65, 1997). These devices have fine print warnings about keeping a distance. When they are switched on they are susceptible to send out bursts of RF radiation. Streaming video produces the highest radiation emissions. FCC exposure standards are designed only to protect you from thermal (heating) effects. They do not protect you from non-thermal adverse biological effects which are very well documented. An effective way of reducing the effects of your exposure to electric fields is grounding (I’m using the terms earthing and grounding interchangeably here). There are two issues to grounding, grounding yourself and grounding your computer equipment. Let me deal with grounding your computer equipment first. The question you should be asking yourself is, ‘is my computer equipment grounded’? If you’re in North America and your power cord has three-prongs that means your computer is grounded. That’s good. If your plug has only two prongs, however, then your laptop will be ungrounded. If you only have a 2 pin plug you can ground your laptop or desktop computer by attaching a wire from a metal component (screw or socket) of your computer to the ground terminal on your electricity wall socket. Or you can use an alligator clip on a wire (as in photo), which you then connect to ground by plugging into an electrical socket. Electricity follows the path of least resistance, so doing this will enable EMFs generated by your computer to ground through the wire and not through you. If you’re not sure if your outlet is properly grounded you can check this easily and inexpensively with an outlet circuit tester . The second issue is earthing or grounding yourself. There are some experts who recommend earthing under any circumstances. My recommendation is slightly more nuanced. I recommend grounding your computer equipment first and foremost. You can then decide whether to earth yourself using earthing pads or mats. I will explore this question more fully in another article. Use the tips listed on this page to reduce your exposure to computer radiation and reduce the effects of that exposure on your health.